On Friday 30th July we picked up the van, with newly-fitted clutch and decided to push on as far as we felt able. The unscheduled stay in Barnstaple had put our plans back a few days and we needed to start heading towards Scotland. The van performed well and a little while later we left Devon and arrived at Glastonbury in Somerset, not a great distance from the site of the festival we had visited a little over a month earlier. The Isle of Avalon campsite was our home for the next three nights, and we went up to the top of the Glastonbury Tor to watch the sun go down on the Sunday evening. The Glastonbury Abbey Festival was on that weekend, so we heard bits of Van Morrison on the Friday and saw a glimpse of Jools Holland on the Sunday. Saturday’s performance was by the Royal Philharmonic Orchestra, who we saw rehearsing while we were visiting the Abbey on Saturday afternoon, and we were able to enjoy much of the accompanying fireworks display from the campsite later that night. We stayed at Big Meadow for an extra day, finally leaving on Tuesday 27th July. After popping in to the VW dealer in Barnstaple to pick up a replacement relay, we headed up to the North Devon coast, across Exmoor, aiming for Lynton. As we came off the moor and turned for Lynton, we came across an incredibly tight corner heading up a hill. The van struggled to get round the corner and up the hill, but we thought we’d made it and were climbing up the subsequent slope as I noticed that the clutch wasn’t working properly. A nasty burning smell confirmed that the clutch had gone getting up and round the corner. Stuck halfway up the hill, with no forward traction and no mobile phone signal was a less than an ideal situation. Fortunately, several kind people stopped and offered help including a couple of young blokes in a Range Rover. They towed us to the top of the hill where we were able to call the RAC again. The RAC send a recovery vehicle and suggested that they recover us as far as the local garage at Lynton. As we couldn’t make it to a campsite, and with the clutch working a little, we found a quiet car park by a local football pitch and after a couple of drinks and a meal in Lynton, bedded down for the night. The next morning we crawled up to the garage in Lynton only to find that they were too busy to be able to perform the repair for at least a week. Calling the RAC again resulted in them agreeing to perform a second recovery, as they had suggested the first garage themselves. The same guy turned up as the previous day, and we took the van to the VW garage in Barnstaple which we’d visited only the previous day. Without the van, we had nowhere to sleep, so booked a couple of nights in the Royal & Fortescue Hotel in the centre of Barnstaple. Proper beds and a shower that you don’t you don’t have to feed with 20p coins or keep pressing a button for! We spent a couple of days looking round Barnstaple, going to see Shrek 2 at the cinema (we needed a laugh at this point) and walking part of the Tarka Trail along the coast to Instow. 22nd July saw us make the journey out of Cornwall and into Devon, to the Hidden Valley site near Braunton. Another very professionally operated site in, as you would guess, a valley. Valleys and seaside hillsides seem to be a favoured location for campsites, with one major drawback being that TV and radio reception is pretty much non-existant. Without these, and if getting to a newsagents is awkward, you can start to feel a little bit cut off from the outside world. We weren’t able to extend our stay at Hidden Valley, due to it being booked up with families for the weekend, so we set off towards Ilfracombe in search of another site for Saturday and Sunday. After various fruitless visits, we found the Big Meadow site near Ilfracombe and booked in for a couple of nights. On our way to the site, I noticed that the indicator light was half-lit on the dashboard, so we stopped and found that neither the indicators nor the hazard lights were working. We found a safe yard to stop in and called the RAC. While waiting for them to turn up, I found that the indicator relay was showing signs of scorching, and that the fuses to the indicator and hazard lights had blown. On arrival the RAC man, who was very friendly, changed the fuses only for them to immediately blow again on testing. Further investigation revealed that the tow bar electrical cable hadn’t been secured properly by whoever fitted it. As a result it had been resting on the exhaust pipe and had melted through and shorted out. A bit of insulating tape and a cable tie and that was sorted. We changed the fuses again and everything was working (though the burnt relay would need replacing). After several hours delay we finally made it to Big Meadow for Saturday evening. Staying at Big Meadow was an experience. The site is run by a lovely couple who are very welcoming and there are lots of activities planned to keep kids amused. Unfortunately, the older teenagers on the site decided to amuse themselves on the Saturday night by running around shouting and generally causing a disturbance. It got so bad that the site owner came out and gave them a severe telling-off, which seemed to do the trick and things were much quieter after that. On the 19th July we moved up the coast to Padstow, staying at a site close to the town, and a short cycle ride from Rick Stein’s various seafood establishments in the area. Being on a budget, and not having pre-booked several months before we opted for the Rick Stein Fish & Chip shop. Having placed our order we had to wait 30 minutes for the food to turn up, and frankly, we weren’t terribly impressed by fish & chips and squid & chips coming in at over Â£14 takeaway! The rain came down again and made our stay at Camelford on the next day, rather uneventful, if a little damp. Bude was our next destination, the Wooda campsite in particular. Very nice, well-managed site, perhaps even a little too professional! We only stayed there for one night, but enjoyed walking round Bude, and we did consider returning to the site a few days later. By this stage, the schools had broken up and a lot of the campsites were filling up with families and their children. I stopped updating this log for a while as we hadn’t seen sight nor sound of an internet cafe. So, from here on in it may be a bit sparse in places. We stayed for 3 nights at the first site near St Just-in-Penwith, in Kelynack, and then another 2 nights at another site in Botallack, the other side of St Just. While there we spend a day over at Merazion, close to St Michael’s Mount, though we didn’t venture over to the island, as the causeway was underwater and we didn’t fancy the boat trip. That was a warm, if not sunny, day unlike most of the others in St Just which were quite misty and wet. On one of the other reasonable days we drove to St Ives. Our main reason for going was to visit the Tate St Ives gallery. We parked just around the corner and wandered round the gallery. Some odd exhibits (for example, a video of a man wandering about in a windy desert telling jokes) and some very interesting. The main exhibition on at the time was a series of John Nash works. The most interesting of these was called simply Boulder. We watched the video which explains how Nash carved a boulder out of a block of wood and dumped it in a local stream in Wales. He then tracked its movements as it was pushed downstream by floods and spring water, taking still photos of moving footage every now and then. Over a period of 25 years the boulder moved down into a river and then into an estuary before finally disappearing in 2003. It just struck me as a great idea and the film of just the boulder at various parts of its journey along with a caption giving the date of the clip was very effective. Next stop on the journey was due to be St Agnes, but it was pouring with rain when we arrived, and after a brief walk around we decided to head straight up to the Higher Moor campsite near Newquay. This was quiet site with no advertising but a good one, close to Porth Joke and a few other bays. We stayed for a few days, cycling down to the bay and sitting enjoying the occasionally good weather. We visited Newquay for one morning which was probably enough, and spent an afternoon catching up with the washing in a laundrette in St Columb Major. During our time at Higher Moor, we got the awning out and found it gave us quite a bit more room for storage, making the whole process of getting the bed out considerably less painful. Thursday 8th July – We were due to continue the journey West, but the continuing grim weather (still very windy but not raining) made us reconsider, and decide to stay at Treveor for another night. We booked a few nights at a campsite near St Just, down by Land’s End for our next stop. Wednesday 7th July – We awoke to grey cloudy skies, completely different to the previous two days. 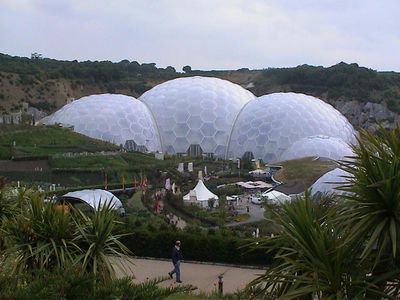 We headed off to the Eden Project, just the other side of St Austell. The traffic through St Austell is grim, which didn’t bode well. Strangely though, the traffic eased as we got closer to Eden, so it must just be St Austell that has traffic problems. We parked the van in the camper section (coincidentally, next to the same German vehicle we had parked next to at Heligan!) and got on the Park and Ride bus to the actual project entrance, marvelling at the architecture of the “biomes” as we got closer. As we joined the queue, it started to rain, but the queue moved fairly quickly so we didn’t get too wet. We headed for the “Temperate Biome” and found it to be very crowded, to the point where all the visitors were shuffling along in a sheep-like manner. The plants and information weren’t as interesting as those at Heligan and we emerged a little disappointed. By this point it was 2pm, so we went to get lunch. The system in the main restaurant is pretty chaotic, especially when it’s raining outside and the site is busy. You have to first find an empty table, then order your food and wait for a waitress to bring it to your table. Sadly, when the outside tables are out of action due to the rain, there aren’t enough tables of the number of customers, so people end up wandering round looking for somewhere to sit. After a slow, but good lunch, we went over to the other biome, dedicated to Tropical plants. This was more interesting that the Temperate area, with a wider variety of more interesting plants. The biome is kept very humid, and again was very busy. The humidity is maintained using rain water which falls on the biomes, and on the day we were there, there was plenty of it! Following that, we started looking round the outside areas but the continuing foul weather forced us to catch the landtrain (tractor with some coaches) back to the entrance and shop. The weather didn’t help but we were a bit disappointed with the whole Eden Project, having found Heligan more interesting and better value for money. Maybe we’re spoiled having seen coffee, cocoa, spices and tropical fruit growing in their natural habitat while on previous holidays. The weather didn’t let up when we got back to the campsite, in fact there was a severe weather warning issued for the South West of England. As we huddled in the van the wind grew stronger and the rain fell heavier. We had to wring out the Jeyes cloths soaking up the leak by the skylight. As the van rocked in the wind, we battened down the hatches and turned in for a rocking, windy night. Tuesday 6th July. Another blindingly sunny day. We decided to visit The Lost Gardens of Heligan which are only a few miles from Treveor. The gardens at Heligan were re-discovered in 1990, having fallen into disrepair after many of the workers were killed during the First World War. The restoration is an ongoing process but the excellent guidebook and information points give a huge amount of detail of the state of the various parts of the garden when re-discovered, their history and the current growing plans. We spent many hours wandering the gardens, visiting the Jungle area, as well as the main Northern Gardens. The house at Heligan is now privately owned (and has been split into multiple apartments) so cannot be visited, but there’s more than enough to see in the grounds. Very definitely worth a visit. The day had remained beautifully sunny, and we both caught a bit of sun, though a liberal coating of sunscreen earlier in the day had prevented burning. On the way back to the site we took a detour to a nearby beach, parking at a car park at the top of the hill and walking down the steep slope to Hammick Beach. The beach is very quiet, being a bit out of the way, but is completely unspoilt. Another barbecue under a clear sky and we headed for bed. Monday 5th July – Time to move on again, down towards St Austell this time. We found a couple of possible sites , one right next to the Lost Gardens of Heligan and another (much cheaper) at Treveor a few miles away. En route we decided to visit the house and gardens at Lanhydrock, a National Trust property. The weather had improved immensely, with bright sun and cloudless skies. On arrival we discovered that the house is closed on Mondays, but spent some time looking round the gardens and grounds, including the parish church which is next to the house. We ended up at the cheaper site at Treveor, a bit more exposed, but given the improved weather, that wasn’t an issue. We had a great barbecue that evening and settled in for the night. Sunday 4th July – Close to Looe is a Monkey Sanctuary. It is home to thirteen Woolly Monkeys, some which were bred at the sanctuary and some which were rescued. The sanctuary is now also home to several Capuchin monkeys, all of which have been rescued. The Woolly Monkeys have a series of interconnected enclosures which they are free to wander between. The Sanctuary has recently stopped its breeding programme as there is no longer any viable mechanism to release the Woolly Monkeys back to their natural habitat in the Amazon rainforest. The monkeys seem to be happy in their social group and despite the damp weather were up and about keeping an eye on the visitors.